Lung cancer is the leading cause of cancer-related mortality in the United States. Swift diagnosis, simultaneous staging, and performing mutation analyses when indicated permits rapid initiation of appropriate treatment which is the objective of the evaluation of every patient with a suspected or known lung cancer. A multi-disciplinary diagnostic thoracic tumor board evaluation guiding the use of combined positron emission tomography-computed tomography, endobronchial ultrasound guided fine needle aspiration, endoscopic ultrasound guided fine needle aspiration, electromagnetic navigational bronchoscopy, mediastinoscopy, thoracentesis, video-assisted thoracoscopic surgery, and or computed tomography or ultrasound guided fine needle aspiration is critical in our opinion to achieve this goal. Lung cancer remains the leading cause of cancer-related mortality in the United States despite advances in chemotherapeutic options and surgical technique. The evaluation of patients with suspected or known lung cancer requires accurate and preferably rapid diagnosis and staging to facilitate the optimal treatment regimen: surgical resection, surgical resection with adjuvant chemotherapy, stereotactic radiotherapy, chemotherapy alone, or chemotherapy in conjunction with radiation therapy. Currently, staging may include combined positron emission tomography – computed tomography (PET-CT) imaging, endobronchial ultrasound guided fine needle aspiration (EBUS-FNA), endoscopic ultrasound guided-FNA (EUS-FNA), electromagnetic navigational bronchoscopy, mediastinoscopy, thoracentesis, video-assisted thoracoscopic surgery (VATS), and or computed tomography (CT) or ultrasound guided FNA. In this article, I will review the current system for staging non-small cell lung cancer (NSCLC), the different diagnostic and staging options, and a brief discussion about the importance of mutation analyses in guiding treatment for patients with advanced stage disease. I will then provide a summary of our center’s approach towards lung cancer diagnosis and staging with supporting literature where available. 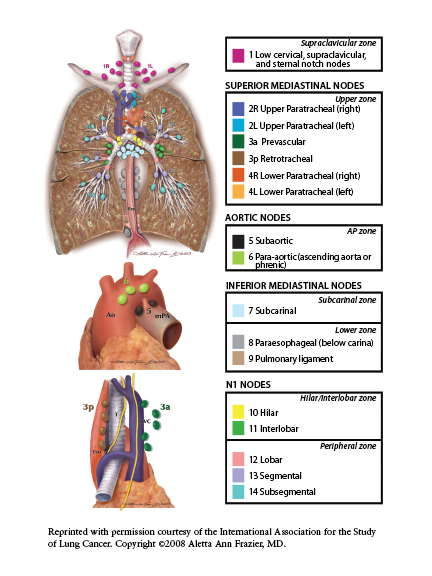 The current staging system1 published in 2010 continues with the pre-existing method of assessing tumor size and its affect on the surrounding lung tissue or its interaction with non-lung tissue (T), the extent of spread of lung cancer to lymph nodes (N) (Figure 1), and the presence or absence of metastatic spread of lung cancer outside of lung tissue (M). The TNM classification system is then used to derive a stage of NSCLC which ranges from localized disease (stage IA) to wide-spread disease (stage IV) providing information on expected prognosis and survival. Prior to the development of EBUS-FNA, patients who were candidates for surgical resection of suspected or diagnosed lung cancer often required a staging mediastinoscopy to evaluate for potential spread of cancer to lymph nodes in the mediastinum, the area within the chest located between the two lungs that contains the trachea, esophagus, heart, and the great vessels. However, mediastinoscopy is associated with a complication rate of as high as 2-3%, and more importantly is unable to sample certain lymph nodes such as hilar (station 10, 11, 12), para-aortic (station 6), or aortopulmonary window (station 5) lymph nodes. Consequently, subsequent thoracotomy has been reported to result in no tumor resection in up to 10% of patients because of detection of advanced stage lung cancer at the time of surgery.15 EBUS-FNA is an alternative minimally invasive technique that complements mediastinoscopy by its ability to access lymph node stations 2, 3, 4, 7, 10, and 11. (Table 1) EBUS is a bronchoscopic technique that utilizes ultrasound to identify and permit real-time ultrasound-guided needle biopsy of paratracheal, hilar, and interlobar lymph nodes. Krasnik (2003) reported their initial experience with EBUS-FNA of mediastinal and hilar lesions under general anesthesia.15 These investigators reported accurate sampling of lymph nodes from stations 1, 2, 4, 7, and 10, with 9 diagnoses of malignancy and 2 diagnoses of benign disease. Yasufuku (2004) reported their experience with 70 patients who underwent EBUS-FNA of mediastinal (stations 2, 3, 4, and 7) and hilar (stations 10 and 11) adenopathy under local anesthesia, reporting a sensitivity and specificity for malignancy of 95.7% and 100%, respectively.16 Five of the sampled lymph nodes were described as 1 cm or less in diameter with the 2 false-negative biopsies occurring in lesions between 1.1 and 2.0 cm. Yasufuku (2005) published additional EBUS-FNA experience with 105 patients reporting a sensitivity and specificity for malignancy of 94.6% and 100%, respectively.17 Additional studies report sensitivities and specificities for malignancy of 88.9% – 94% and 96.4% – 100%, respectively.18 A recent retrospective study out of Australia demonstrated that EBUS alone can achieve a false negative rate for mediastinal lymph node sampling of only 4.9%.19 These studies have demonstrated that EBUS-FNA is a minimally invasive alternative as well as a complementary procedure to mediastinoscopy for mediastinal and hilar staging, respectively, for known or suspected NSCLC. EUS is an additional minimally invasive ultrasound-based technique which uses esophagogastroendoscopy to sample para-esophageal lymph nodes. These include paratracheal (station 4), aortopulmonary window (station 5), posterior subcarinal (station 7), paraesophageal (station 8), and pulmonary ligament (station 9) lymph nodes. (Table 1) Consequently, this technique complements both mediastinoscopy and EBUS-FNA with the additional advantage of being able to access stations 8 and 9 as well as subdiaphragmatic structures including the celiac nodes and the adrenal glands. Studies evaluating EUS-FNA for lung cancer, excluding one, have demonstrated sensitivities and specificities for malignancy of 87% – 96% and 100%, respectively which is comparable to EBUS-FNA.20 However, one study reported a lower sensitivity and specificity of 86% and 83%, respectively.21 Overall, these studies demonstrate that EUS is a valuable diagnostic and staging tool for patients with suspected or known NSCLC. One of the most significant limitations to using bronchoscopy for the diagnosis of early stage lung cancer is the inaccuracy of bronchoscopy directed biopsy of lung nodules. A recent advance in bronchoscopy called electromagnetic navigational bronchoscopy (ENB) is now able to overcome this limitation for select lesions that are more than 1 to 1.5cm in diameter. This system marries CT imaging with bronchoscopy allowing the physician to determine the position of the bronchoscope and a special guidance catheter within the lung of a patient. By performing pre-procedural planning, the physician is now able to maneuver a guidance catheter through a patient’s airways to biopsy lung nodules that are concerning for cancer. The guidance catheter is made up of a flexible inner wire which emits electromagnetic pulses inside of a plastic sheath which is then left in place once the catheter has been successfully maneuvered to the lung nodule. However, the actual biopsy is performed assuming the catheter position is accurate and in close proximity to the lung nodule. In addition, the system allows the placement of fiducial markers around the lung nodule to facilitate treatment with stereotactic radiation. The major limitations to the success of the procedure include the patient’s ability to tolerate bronchoscopy and its associated sedation, the size of the lesion of interest as well as its location, the experience of the physician performing the procedure, and that the actual biopsy is not performed under real-time visualization of the target. This final limitation is significant because the position of the catheter relative to the target nodule may change as the patient is breathing and the catheter may be dislodged when biopsy tools are inserted into the sheath leading to the nodule. Consequently, the diagnostic accuracy of this biopsy modality for peripheral nodules ranges between 69-74%.22 In addition, this procedure is not recommended for patients who have an implanted cardioverter defibrillator or pacemaker due to potential interference between these devices and the electromagnetic field created by the bronchoscopy system. Risks of the procedure include pain, bleeding, or collapsed lung. However, these risks occur less frequently when compared to CT-guided biopsy or CT-guided placement of fiducial markers. Patients with suspected or known NSCLC who are found to have extra-thoracic disease on PET-CT imaging should undergo tissue biopsy to confirm a metastatic focus. This can be achieved using CT-guided or ultrasound guided fine needle aspiration. The procedure is generally very well tolerated and can be performed in an outpatient setting. Figure 4. of Chest. 2009;136:260-71. The diagnostic evaluation of a patient with suspected lung cancer in the early 21st century includes 3 specific goals: 1. Does the patient have lung cancer and if so, what type of lung cancer is present? 2. What is the pathologic stage of lung cancer? 3. If appropriate, are specific mutations or immunomodulatory targets present in the lung cancer that could be targeted by a specific therapy? Using the techniques described above, the ideal for an individual patient would be to achieve these 3 goals in a single procedural setting so it is absolutely critical that the proceduralist is aware of the need to obtain an adequate amount of diagnostic tissue to accomplish these 3 goals. Currently, this is possible but as the number of targeted mutations increases, we may reach a point where a separate diagnostic procedure is needed to obtain enough tissue for all of the testing needed to determine the most appropriate first line treatment. An exciting and promising area of investigation is the use of a blood sample or a “liquid biopsy” to assess for multiple mutations but this is beyond the scope of this chapter to review. Epidermal Growth Factor Reception (EGFR) The most prevalent targetable mutation is epidermal growth factor receptor (EGFR). This particular mutation is most frequently found in lung adenocarcinomas and is more frequent in women, never smokers, and patients of East-Asian origin. The FDA has approved multiple treatment options targeting EGFR. Anaplastic Lymphoma Kinase (ALK) – Rearrangements ALK rearrangements are primarily found as fusions to echinoderm microtubule-like protein 4 (EML4) and have been detected in 4%42 to 7% of NSCLCs.43 Patients with an EML4-Alk mutation are more likely to have lung adenocarcinoma, more likely to be light to never smokers, more likely to be men, and tend to be younger.44 There are FDA approved treatments directed against this mutation. Kirsten Rat Sarcoma Virus (KRAS) While rare (1 to 2% of NSCLCs), mutations of ROS1 are more likely to be found in patients with lung adenocarcinomas who were never smokers and are younger in age. The FDA has approved treatments directed against this mutation. C-ros Oncogene 1 (ROS1) While rare (1 to 2% of NSCLCs), mutations of ROS1 are more likely to be found in patients with lung adenocarcinomas who were never smokers and are younger in age. The FDA has approved treatments directed against this mutation. Programmed death 1 (PD-1) / Programmed death ligand 1 (PD-L1) Some tumor cells are able to persist by evading the immune system by expressing on their cell surface PD-L1 which then interacts with T-cell surface receptor PD-1. This interaction then down-regulates the T-cell which allows the tumor cell to escape clearance by the immune system. Therapies targeting PD-1 or PD-L1 aim to prevent this T-cell – tumor cell interaction thereby restoring the anti-tumor function of the native immune system. This area of oncology treatment, immunotherapy, represents an exciting new treatment option for patients with non-small cell lung cancer who have had recurrent disease following primary treatment. Additional Mutations With the identification of multiple potential cancer driving mutation targets, many oncologists are approaching lung cancer as a chronic disease in which serial assessment for targetable mutations may identify additional salvage therapy options over time. A detailed review of these potential treatments and their application is beyond the scope of this chapter. Who should undergo mutation analyses? Currently, all patients with pathologically confirmed advanced-stage non-small cell lung cancer should have biopsy specimens sent for mutation analyses as directed by the medical oncologist to assist in their treatment planning regardless of gender, ethnicity, or smoking history. Interestingly, a recently published meta-analysis has revealed a discordance rate of 12% between the primary tumor and metastatic lymph node tissue for the presence of an EGFR activating mutation where the primary tumor is more likely to harbor the mutation.45 The clinical significance of this finding is not yet clear. The key point to emphasize is that the goal of the proceduralist performing the biopsy is to keep the 3 above-mentioned goals in mind – diagnosis, stage, and if appropriate tissue for mutation analyses. So, obtaining enough tissue to perform these 3 goals is critical to the evaluation and management of patients with advanced stage non-small cell lung cancer. Our center has established a Diagnostic Thoracic Tumor Board that brings together the knowledge and expertise of our pulmonologists, oncologists, radiologists, and thoracic surgeons to evaluate patients with suspected or confirmed lung cancer employing standardized protocols to assist in the decision to pursue invasive testing versus serial imaging studies.46-49 It is our opinion that patients with suspected or known lung cancer should receive rapid, cost-effective, accurate diagnosis, and staging so that the appropriate treatment may be initiated in a timely manner. Our goal for all patients is to have a diagnosis and cancer stage within 7 days of referral and to have the appropriate treatment initiated within 14 days. All patients we evaluate with suspected or known NSCLC and who are potential candidates for surgical resection undergo PET-CT to evaluate for mediastinal disease and possible distant metastases. This practice is supported by 2 studies. Fischer (2009) published a prospective randomized trial evaluating the effect of combined PET-CT on the number of futile thoracotomies performed in patients with highly-suspected or newly diagnosed NSCLC.5 Futile thoracotomy was defined as a final diagnosis of a benign process, pathologically proven NSCLC stage IIIA-N2, IIIB, or IV disease, inoperable T3 or T4 disease, or recurrent malignancy or death from any cause within 1 year of randomization. A significant decrease in futile thoracotomies was achieved using PET-CT pre-operatively compared to conventional staging (21 of 60 vs. 38 of 73, p=0.05). A similar result was reported in an earlier publication using PET.6 Diagnosis if not previously made and staging is achieved by biopsy of the PET-avid lesion that would achieve the most advanced pTMN stage. Biopsy methods for lymph nodes within the chest are described in Table 1. The preferred route of biopsy of mediastinal lymph nodes is to start with either EBUS or EUS depending upon the lymph node of interest. If the biopsy result is negative by EBUS or EUS, a confirmatory mediastinoscopy is recommended prior to proceeding to surgical resection. Lung cancer survival is strongly associated with the stage of disease and the resulting application of appropriate treatment. With the introduction of combined PET-CT, EBUS, and EUS to mediastinoscopy, patients can now be accurately staged avoiding unnecessary thoracotomies. To improve the timely application of appropriate staging and diagnostic studies, a multidisciplinary panel of physicians is important and in our opinion essential. Edge, S.B. and C.C. Compton, The American Joint Committee on Cancer: the 7th edition of the AJCC cancer staging manual and the future of TNM. Ann Surg Oncol, 2010. 17(6): p. 1471-4. Sazon, D.A., et al., Fluorodeoxyglucose-positron emission tomography in the detection and staging of lung cancer. Am J Respir Crit Care Med, 1996. 153(1): p. 417-21. Pieterman, R.M., et al., Preoperative staging of non-small-cell lung cancer with positron-emission tomography. N Engl J Med, 2000. 343(4): p. 254-61. Gould, M.K., et al., Accuracy of positron emission tomography for diagnosis of pulmonary nodules and mass lesions: a meta-analysis. JAMA, 2001. 285(7): p. 914-24. Fischer, B., et al., Preoperative staging of lung cancer with combined PET-CT. N Engl J Med, 2009. 361(1): p. 32-9.
van Tinteren, H., et al., Effectiveness of positron emission tomography in the preoperative assessment of patients with suspected non-small-cell lung cancer: the PLUS multicentre randomised trial. Lancet, 2002. 359(9315): p. 1388-93. Hamberg, L.M., et al., The dose uptake ratio as an index of glucose metabolism: useful parameter or oversimplification? J Nucl Med, 1994. 35(8): p. 1308-12. Kubota, K., et al., Advantage of delayed whole-body FDG-PET imaging for tumour detection. Eur J Nucl Med, 2001. 28(6): p. 696-703. Rogasch, J.M., et al., Dual time point imaging for F18-FDG-PET/CT does not improve the accuracy of nodal staging in non-small cell lung cancer patients. Eur Radiol, 2016. 26(8): p. 2808-18. Hara, T., et al., Uptake rates of 18F-fluorodeoxyglucose and 11C-choline in lung cancer and pulmonary tuberculosis: a positron emission tomography study. Chest, 2003. 124(3): p. 893-901. Gould, M.K., et al., Test performance of positron emission tomography and computed tomography for mediastinal staging in patients with non-small-cell lung cancer: a meta-analysis. Ann Intern Med, 2003. 139(11): p. 879-92. Erasmus, J.J., et al., Evaluation of primary pulmonary carcinoid tumors using FDG PET. AJR Am J Roentgenol, 1998. 170(5): p. 1369-73. Cheran, S.K., N.D. Nielsen, and E.F. Patz, Jr., False-negative findings for primary lung tumors on FDG positron emission tomography: staging and prognostic implications. AJR Am J Roentgenol, 2004. 182(5): p. 1129-32. Hoekstra, C.J., et al., Prognostic relevance of response evaluation using [18F]-2-fluoro-2-deoxy-D-glucose positron emission tomography in patients with locally advanced non-small-cell lung cancer. J Clin Oncol, 2005. 23(33): p. 8362-70. Krasnik, M., et al., Preliminary experience with a new method of endoscopic transbronchial real time ultrasound guided biopsy for diagnosis of mediastinal and hilar lesions. Thorax, 2003. 58(12): p. 1083-6. Yasufuku, K., et al., Real-time endobronchial ultrasound-guided transbronchial needle aspiration of mediastinal and hilar lymph nodes. Chest, 2004. 126(1): p. 122-8. Yasufuku, K., et al., Endobronchial ultrasound guided transbronchial needle aspiration for staging of lung cancer. Lung Cancer, 2005. 50(3): p. 347-54. Herth, F.J., et al., Endobronchial ultrasound-guided transbronchial needle aspiration of lymph nodes in the radiologically normal mediastinum. Eur Respir J, 2006. 28(5): p. 910-4. Taverner, J., et al., Negative EBUS-TBNA Predicts Very Low Prevalence of Mediastinal Disease in Staging of Non-Small Cell Lung Cancer. J Bronchology Interv Pulmonol, 2016. 23(2): p. 177-80. Silvestri, G.A., et al., Endoscopic ultrasound with fine-needle aspiration in the diagnosis and staging of lung cancer. Ann Thorac Surg, 1996. 61(5): p. 1441-5; discussion 1445-6. Gress, F.G., et al., Endoscopic ultrasonography, fine-needle aspiration biopsy guided by endoscopic ultrasonography, and computed tomography in the preoperative staging of non-small-cell lung cancer: a comparison study. Ann Intern Med, 1997. 127(8 Pt 1): p. 604-12. Eberhardt, R., et al., Multimodality Bronchoscopic Diagnosis of Peripheral Lung Lesions. American Journal of Respiratory and Critical Care Medicine, 2007. 176(1): p. 36-41. Ishida, M., et al., Transbronchial Biopsy Using Endobronchial Ultrasonography with a Guide Sheath Increased the Diagnostic Yield of Peripheral Pulmonary Lesions. Internal Medicine, 2012. 51(5): p. 455-460. Chen, A., et al., Radial Probe Endobronchial Ultrasound for Peripheral Pulmonary Lesions. A 5-Year Institutional Experience. Annals of the American Thoracic Society, 2014. 11(4): p. 578-582. Sanchez-Font, A., et al., Endobronchial ultrasound for the diagnosis of peripheral pulmonary lesions. A controlled study with fluoroscopy. Arch Bronconeumol, 2014. 50(5): p. 166-71. Okachi, S., et al., Factors Affecting the Diagnostic Yield of Transbronchial Biopsy Using Endobronchial Ultrasonography with a Guide Sheath in Peripheral Lung Cancer. Internal Medicine, 2016. 55(13): p. 1705-1712. Chee, A., et al., Diagnostic utility of peripheral endobronchial ultrasound with electromagnetic navigation bronchoscopy in peripheral lung nodules. Respirology, 2013. 18(5): p. 784-789. Sortini, A., et al., [Video-assisted mediastinoscopy. A new application of television technology in surgery]. Minerva Chir, 1994. 49(9): p. 803-5. Leschber, G., G. Holinka, and A. Linder, Video-assisted mediastinoscopic lymphadenectomy (VAMLA)–a method for systematic mediastinal lymphnode dissection. Eur J Cardiothorac Surg, 2003. 24(2): p. 192-5. Hammoud, Z.T., et al., The current role of mediastinoscopy in the evaluation of thoracic disease. J Thorac Cardiovasc Surg, 1999. 118(5): p. 894-9. Coughlin, M., et al., Role of mediastinoscopy in pretreatment staging of patients with primary lung cancer. Ann Thorac Surg, 1985. 40(6): p. 556-60. Luke, W.P., et al., Prospective evaluation of mediastinoscopy for assessment of carcinoma of the lung. J Thorac Cardiovasc Surg, 1986. 91(1): p. 53-6. Detterbeck, F.C., et al., Invasive mediastinal staging of lung cancer: ACCP evidence-based clinical practice guidelines (2nd edition). Chest, 2007. 132(3 Suppl): p. 202S-220S. Best, L.A., et al., The contribution of anterior mediastinotomy in the diagnosis and evaluation of diseases of the mediastinum and lung. Ann Thorac Surg, 1987. 43(1): p. 78-81. Page, A., et al., Surgical treatment of bronchogenic carcinoma: the importance of staging in evaluating late survival. Can J Surg, 1987. 30(2): p. 96-9. Aleman, C., et al., The value of chest roentgenography in the diagnosis of pneumothorax after thoracentesis. Am J Med, 1999. 107(4): p. 340-3. Light, R.W., Clinical practice. Pleural effusion. N Engl J Med, 2002. 346(25): p. 1971-7. Light, R.W., Pleural diseases. Curr Opin Pulm Med, 2003. 9(4): p. 251-3. Landreneau, R.J., et al., Thoracoscopic mediastinal lymph node sampling: useful for mediastinal lymph node stations inaccessible by cervical mediastinoscopy. J Thorac Cardiovasc Surg, 1993. 106(3): p. 554-8. Eggeling, S., et al., Invasive staging of non-small cell lung cancer–a prospective study. Eur J Cardiothorac Surg, 2002. 22(5): p. 679-84. De Giacomo, T., et al., Thoracoscopic staging of IIIB non-small cell lung cancer before neoadjuvant therapy. Ann Thorac Surg, 1997. 64(5): p. 1409-11. Rikova, K., et al., Global survey of phosphotyrosine signaling identifies oncogenic kinases in lung cancer. Cell, 2007. 131(6): p. 1190-203. Koivunen, J.P., et al., EML4-ALK fusion gene and efficacy of an ALK kinase inhibitor in lung cancer. Clin Cancer Res, 2008. 14(13): p. 4275-83. Shaw, A.T., et al., Clinical features and outcome of patients with non-small-cell lung cancer who harbor EML4-ALK. J Clin Oncol, 2009. 27(26): p. 4247-53. Wang, F., et al., Comparison of Epidermal Growth Factor Receptor Mutations between Primary Tumors and Lymph Nodes in Non-small Cell Lung Cancer: a Review and Meta-analysis of Published Data. Asian Pac J Cancer Prev, 2014. 15(11): p. 4493-7. MacMahon, H., et al., Guidelines for Management of Small Pulmonary Nodules Detected on CT Scans: A Statement from the Fleischner Society. Radiology, 2005. 237(2): p. 395-400. Naidich, D.P., et al., Recommendations for the Management of Subsolid Pulmonary Nodules Detected at CT: A Statement from the Fleischner Society. Radiology, 2013. 266(1): p. 304-317. Yip, R., et al., CT screening for lung cancer: alternative definitions of positive test result based on the national lung screening trial and international early lung cancer action program databases. Radiology, 2014. 273(2): p. 591-6. Pinsky, P.F., et al., Performance of lung-rads in the national lung screening trial: A retrospective assessment. Annals of Internal Medicine, 2015. 162(7): p. 485-491.